This must be one of the most rewarding things I've done in the last few months. My retirement sentiments demanded that I must slow down into something interesting; growing fruit and vegetables, for example, and making my own quality hummus have been enormously satisfying. Knowing full well that I can walk the required 12 feet in three seconds, and thus have a 80 percent chance of living another ten years; can you do that, or is it time to see a chiropractor about your ankle? How fast do you walk? For some valuable speed tips keep enjoying this site. How well you stride out will determine how long you live; that's not unimportant, eh? Then I have the hobbies to fill in the gaps of a part time chiropractic practice are vital. Apart from the physical exercise of composting, and the delicious, healthy choice foods, perhaps the best is a sense of reconnecting with nature; there has been something supremely satisfying watching earthworms at work, enjoying the birds, and now hens, in a fresh way. Chasing away the vervet monkeys that are far more serious about organic vegetables than most humans are has been a challenge. We can learn a thing or two from them. Being more environmentally responsible should, I suppose be part of the equation, but I confess it didn't start that way; I am growing into it though. Backyard permaculture I've is what it's called; working with nature rather than against it. I'm a greenie for lots of selfish reasons. Our food tastes splendid; I hardly ever see a medical doctor. Neither my wife nor myself take any medication. We are fitter and stronger and we find it much more satisfying than going to the gym. We have no fears of osteoporosis, diabetes and cancer; we don't need to be constantly dieting. We can and do eat as much as we fancy; even a whole bar of chocolate now and then. Something will get us eventually of course; eternal life is something for the next world. Death, where is thy sting? is reassuring for those who believe and trust in Jesus Christ. I'm not ashamed of it; in fact the belief that our bodies are the temples of God, is why we strive to live healthier lives. "A vegetable garden in the beginning looks so promising and then after all little by little it grows nothing but vegetables, nothing but vegetables." Written of course tongue in cheek, but I wish she was still around to tell her about the hens in our chicken tractor that grow eggs every day; now eggs on a bed of lightly steamed spinach, with a dollop of butter, a red jalapeno and half dozen cloves of garlic makes the best breakfast ever. This chicken tractor design is dragged about the garden to clean up the scraps and the cutworms, and fertilise the patch. We let the hens out for a couple hours in the evening to scour the garden; the compost pile is their favourite. Starting a compost pile looks like a mammoth task. It is, but little by little it's achieved and just look at that crop of green beans. 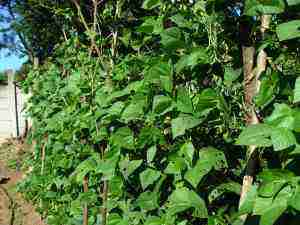 If you're a bit at sea then perhaps growing green beans, and how to plant broad beans might help. They just love growing where there was a compost heap. The immediate benefits for you are healthy and nutritious vegetables and fruit, but getting your garden soil ready is also about capturing carbon from the atmosphere reducing the greenhouse effect that is causing such havoc with our weather. Making a compost pile is actually quite fun, particularly when you come to open it after a couple months. If you let the hens out of the chicken tractor they'll have a gourmet meal as you turn the heap. Did you know that free range eggs have three times as much omega-3? That means much less inflammation in the body, and fewer bouts of depression too. Dinkum; so says research from Johns Hopkins university. Build compost pile Mark I in the background (complete), with starting compost heap Mark II in the foreground. You may think that starting a compost pile is a smelly and expensive business. Mark one, pictured in the background, I'm pleased to say has absolutely zero odour. It's all about aeration; they require plenty of air, but more of that later. Mark two is in the foreground, waiting for a crop of bush beans to go over. Notice the inexpensive building materials; old rotting logs. But it can become a very expensive business if you get into purchasing the best compost bin and kitchen humus containers. 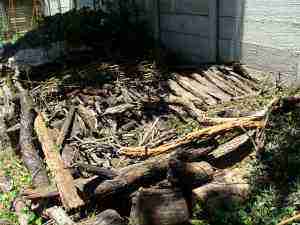 Since I am planning to live and have fun for at least another ten years I reckoned that making a compost pile should be an inexpensive business. Chiropractors are not disgustingly wealthy people. Generally, men can be well satisfied if they reach a healthy 70 with all their marbles intact. But if you have lots of dollars to throw at making your own compost, then be my guest. Amazon will happily accommodate you. And, do you know what? I haven't spent one cent on building a compost bin, but I have had quite a lot of raw materials from my garden. Seven years of neglect whilst we lived in Holland has meant that our garden had turned into a jungle, providing plenty of rotten tree trunks and branches that were just perfect for making a compost pile. But if everything in your backyard has to look neat and tidy then I'm afraid it's Amazon for you. 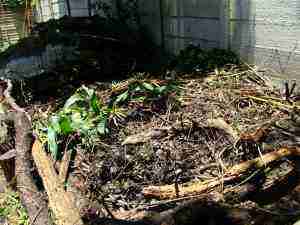 Making a compost pile requires a mix of green and brown material. 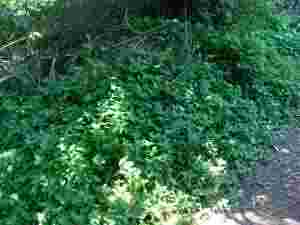 This ground cover called Wandering Jew makes an excellent green for your compost heap. Grass cutting after mowing the grass are excellent too of course. After starting a compost pile you'll find it's teeming with life. In the first phase, with plenty of compost aeration, it gets very hot as a vast array of bacteria and fungi attack the contents of your kitchen compost pail and all the garden waste. You'll be astonished; as fast as you add new material, and build your compost pile, it collapses. The bugs are doing their job. It's all about concentrating the nutrients of cubic metres of plant material into 10 percent or less of the bulk. The wonder of worm farms will speed up the whole process of composting, and give you amazing salads from your garden; no one who eats this kind of food regularly will suffer from constipation and colorectal disease. Creating a divine green salad is not rocket science; a good dollop of homemade hummus, olive oil and lemon juice turns it into a whole meal; with a slice or two of sourdough bread. Your own naturally occurring earthworms are fantastic and you should start to worry if you don't find a couple every time you turn a sod; but they breed slowly, and are not really enough, especially if you have hens to feed. Making a compost pile is greatly helped by the addition of extra worms. There are several other advantages too; they will turn all the left overs from your kitchen, in their own right, into liquid manure and enrich your soil. It will save your local landfill from tons of decomposable waste that, without air will contribute to the greenhouse gases. But if you have rats, rather put them into the worm farm. And, they'll provide a lot more worms to chew through your pile of garden waste, turning it all into the black gold that makes organic vegetables and salads so tasty and healthy. I was astonished that making a compost pile produced so much heat. I couldn't even put my hand into that heap. The temperature rises to as much as 170 degrees. Include not only green material as you build a compost pile. Add plenty of dry stuff like old leaves, decaying sticks, sawdust and any rotting twigs and branches that have been lying about in your garden. Go for at least half green versus dry organic material. Notice the fungus attacking these half rotten sticks. Placed at the bottom of your compost heap, they'll continue to break down to a beautiful dark earthy humus; and provide drainage. Do your best to find a source of cow, horse or chicken manure; it speeds up the process. I bring in a bag from the airfield where we glide every Saturday; during the week the cattle roam the area. Worms love compost, and compost piles love worms. So, every time I take a barrow load of vermicompost, with lots of wrigglies, to the pile, I always bring a load of rich humus back to the worm farm. The worms digest the humus, adding beneficial microbes, and turning it into black gold, as it's often called; vermicompost is the very best you can do for your vegetable garden, extremely rich in nutrients. We let the hens loose on the compost pile periodically; they enjoy some of the worms and add their litter to the heap. There's a whole cycle of nature going on; we end up with beautiful free range eggs. Build compost pile means use of all the bugs of nature to break down sticks and leaves, grass cuttings and prunings from your garden. The corn stalks are going to make wonderful compost. Our succotash recipe is alas over for another year. Frankly, forget the second kind, anaerobic compost bugs, for reasons seen below. Aerobic (full of oxygen) making a compost piles is what we are after. It's much quicker, more environmentally friendly and the heat generated kills unfriendly seeds and bugs, cut-worms, in the compost heap. Within a day or two of making a compost pile (adequate oxygen being available) the temperature rises quickly to 70-80 degrees C (that's hot, just try putting your fingers into the heap when you build your own compost pile.) Bacteria attack the grass cuttings, kitchen compost containers waste, weeds and whatever organic material you chuck into your compost heap. Then, adequate oxygen still being available, other bacteria and fungi start attacking the organic material. Open it up and you'll spot a host of activity. This is an update; all our kitchen waste goes to the worm farm now. We have an infestation of rats and no Pied Piper, so no scraps are allowed in the compost heap. Finally, as the temperature cools, earthworms, snails, millipedes and a gazillion other tiny bugs get stuck in. 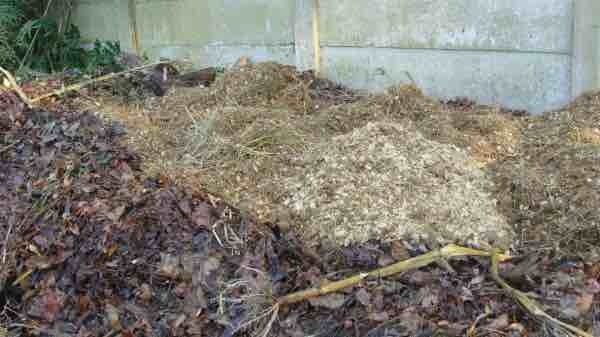 The key if you want to build your own compost heap is good compost aeration - plenty of air. Depending on the amount of oxygen and the size of your organic material, the whole process will take from a few weeks to a couple months. At this stage you can add special worms when making your own compost. It speeds up the process, but frankly isn't necessary. Better still, bring in a batch of old compost that is full of earth worms. They'll breed in no time at all. When digging in the garden, I collect earthworms when I find them, and pop them in the compost heap once it cools off. When you add the compost back into the garden, you return ten times as many earthworms. Sentient moment: Initially, I would toss the earthworms from wherever I was working, directly into the pile. Until one day, I heard a cheep from a tree above the pile. "Thank you very much." A thrush had a mouthful of earthworm! Thereafter, I buried the worms in the pile! The little grey flycatcher peeping to me, a bunting, a loerie shouting, a hadeda complaining at my presence... Mother Nature at her best. And Stealth, a lone Vervet monkey intent on my sweetcorn, um, Mother Nature at her worst! There ain't room for Homo Sapiens and Chlorocebus pygerythrus in the Garden of Eden. One of us must go. Him! If he wants to stay then he better help me with making a compost pile. The compost pile needs to be kept moist but not sodden. When start making a compost pile, build it in partial shade or you'll be watering it every day. The sun helps raise the temperature. Have you watched films of the frozen tundra in Siberia where a scientist making his benthic investigations plunges a stake into the ice, and on lighting a match loses his eyebrows? That's an-aerobic composting. Under water, millenia ago, different compost bugs in the absence of oxygen produce methane and other toxic gases. The whole process is much slower, and contaminates the environment with very smelly substances. Very little heat is produced and the weed seeds and unfriendly bugs aren't killed. To test if your heap is getting enough oxygen, lift a few layers. If the substrate has a slimy look, and stinks, then you have anaerobic composting occuring. Not good. More air is needed. 1. Turn your heap at least once a week if you're feeling strong and enthusiastic; I don't! Turning your heap frequently allows fresh oxygen to reach the bacteria and fungi, worms and other creepy crawlies that are busy making your compost. It works, but you need a tractor, or plenty of time and a strong right arm and low back! 2. Make channels for fresh air in your heap. Making a compost pile requires just the sweat from your brow. Believe you me, Bernard Preston healthy choice foods do not come cheap; it's hard work. When making a compost pile I provide natural air-conditioning! At the base of the compost heap place rotting old sticks or planks, keeping the vent open to the air. 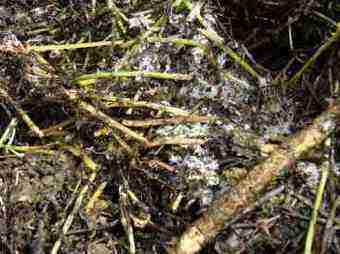 Then every layer, place criss-crossed old, half-rotten sticks which provide airspaces in the body of the compost heap. One layer green organic material, another of dry material, a third of rotten sticks, and some chicken, cow or horse manure is what's needed. Keep them short as possible for easy turning. When building a compost pile, dry hay from a stable for example is perfect. The horse manure mixed with it is just what the gardener ordered! The sticks do inhibit turning the pile easily, but then you only need to turn it once or maybe twice, instead of several dozen times. 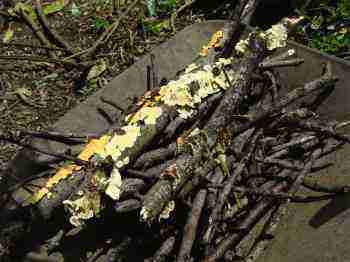 Best to use half-rotten sticks - the aerobic compost bugs will attack the sticks too, rendering them ultimately into beautiful rich compost. Avoid making a compost pit; that simply cuts back on compost aeration and defeats the purpose. You'll get anaerobic composting occurring. In this next photo you can see the greens underneath (at the back), covered with a layer of browns in the foreground. On top of that will go the top half of Mark I. One way or another making your own compost heap requires maximum aeration. Here I am about to turn the top half of Mark I onto Mark II. Underneath I'm expecting to find a lovely coarse matured compost, hopefully full of earthworms. When building your own compost heap, space permitting, try and build at least two or three heaps adjacent to each other. When the second heap is half built, perhaps a metre high, turn the first heap on top of the second. Bring all the material from the bottom, where it will surely be short of oxygen, to the top for better compost aeration. Watch it get hot all over again. You'll know when the process is complete. You'll have a relatively fine, dark, sweet smelling compost that looks almost like soil. 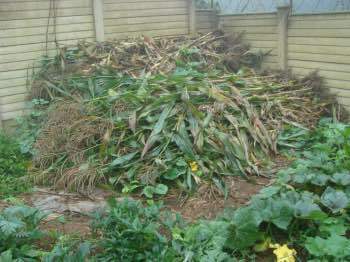 If you have any large pieces that are not completely broken down, for example maize stalks, simply add them again to the next starting a compost pile. Adding horse manure, fresh from the stables, or chicken litter or cow pats for that matter, add immeasurably to your compost pile; they will raise the temperature too, helping to kill any weeds and their seeds. A good compost pile has a carbon: nitrogen ratio of 30:1. General leaves and grass cuttings, for example, are about 50:1. Chicken litter is 10:1, horse too I should think, so collecting your hen's manure, much of which is produced at night, and adding it to your heap makes it ferment much faster. The benefits of compost are legion. Healthy soil is a living material. It's full of minuscule microbes, fungi and earthworms. It's fibrous, full of the coarse break-down products of decay. Then the roots of your next crop can plunge deep down into the soil for nutrients and water. And of course compost adds those very nutrients to the soil. 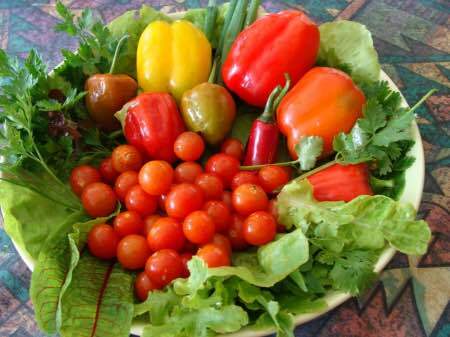 You can grow beautiful healthy vegetables without having to resort to any artificial fertilizers. Have fun. I have! Just look at this crop of Lazy Housewife! They bear for months. GROWING GREEN BEANS ... 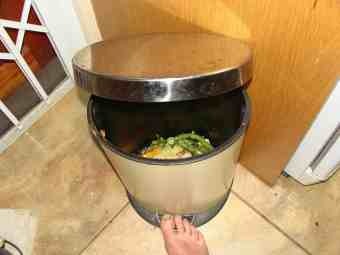 Cooking green beans - it's all about healthy choice foods, and starts with making a compost heap. 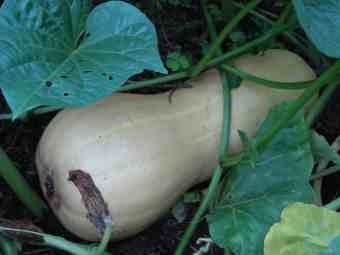 Butternut just love to grow in a compost heap; unlike pumpkins these giants are delicious. What's so good about beans? Mixing protein and/or fat with a carbohydrate lowers the Glycemic Index GI. How quickly the food raises the blood sugar and insulin, the hormone that stores fat. Plus there's oodles of research now that vegetable protein doesn't have all the cancer-causing qualities of too much animal protein. Bernard Preston is turning into a greenie; beans and low GI foods have become very important, even though he has no weight problem; folk who eat these foods are never obese. It all starts with making a compost pile. Kitchen compost containers certainly don't need to be expensive; but it must be dedicated to raw kitchen waste. Empty it every second day, and wash it out regularly. We keep a second one for other kitchen scraps that might include some cooked material; that goes to the worm farm. Meat wastes go to the dogs rather. Being a greenie certainly takes a little time and energy. How committed are you to leaving a healthy planet as a legacy for your grandchildren? In the short term it means less waste to the garbage, perhaps a saving in your country, and better tasting and more nutritious food. That means less visits to the doctor, less pain and with luck a healthy, happy eighty sitting under those trees you once planted. Making a compost pile does pay. Did you know that about a third of our food is never actually eaten? Housewives toss a vast amount of perfectly good food, some of which has been allowed to go off. The race to end waste is on; rather compost it. But operation end waste is only for those who are a bit nuts! Compost bins and compost tumblers are certainly neat and tidy, but how many would I need? At least 20-30 to make the amount of compost my vegetables and fruit trees demand. Sorry Amazon, no cigar from me for compost gadgets! I'm really not interested in compost bin designs or how to make compost tumbler. But if you only have a small garden, in the eye of your neighbours, they are certainly worth a consideration. Not everyone is privileged to have an acre. But there is a cost to making a compost pile; the sweat on your brow! Mind you, there's another plus, I lose a couple pounds after every heavy session in the garden, only 80% of which is water. I'm lighter than I've been for years! And have LESS back pain. 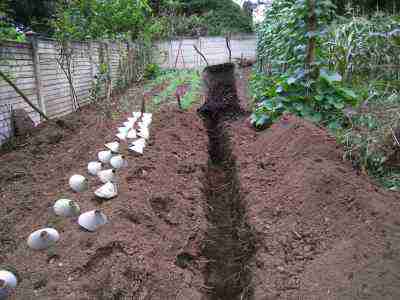 Here I have dug a trench for the compost, before planting chickpeas. I used to toss the kitchen waste straight into the trench until I discovered they composted anaerobically, and stank; composting requires air. No longer do I make compost piles that way. Update: Two months later: the first pods are forming! I can't wait to tuck into them, especially the green chickpeas. Very sweet I believe, never had them before. 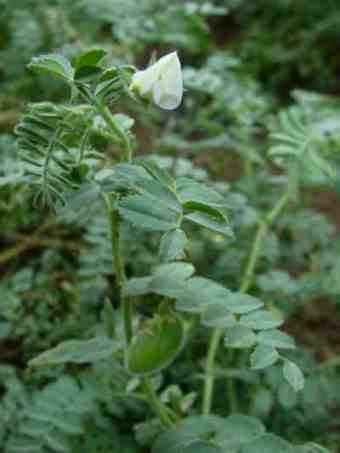 Four months later: The green chickpeas were wonderful, but I've realised they should only be grown in hot dry summer climates. Good for California, not a good return for my effort in hot, wet Hilton, South Africa. Healthy choice foods is what it's all about. If you want to grow them, and enjoy them fresh with no pesticides then making a compost pile is important. It's about working with nature rather than against it; we call it backyard permaculture. Growing broccoli is not difficult, but they take up quite a lot of room; they too are greedy feeders, if you want healthy nutritious heads. 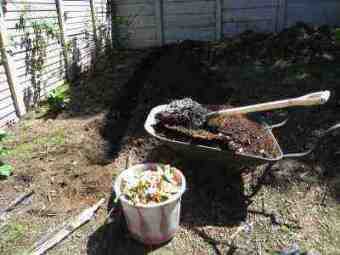 Here I've just dug the third deep trench, with a wheelbarrow of dark, beautiful compost. Each trench is about 60cm deep (about an hour's hard labour), I'll fill the trench with compost, and then replace the soil. You can see Helen's first broccoli seedlings which she has just transplanted, hats to protect them against the African sun. The most difficult part of making a compost pile is sorting out the worms, which are transferred to the next heap; it just speeds up the process. You don't need to bother really. In the far distance you can see the chickpeas and on the right, Lazy Housewife pole beans and butternut squash. Now that we have a worm farm, we don't need to fuss with the fag of separating out the creepy crawlies; every month tens of thousands go into the compost heaps. The chicken "tractor" is a new development and means the chooks manure the land and so the digging of trenches is over for ever, except when growing potatoes; I won't miss it. Watch this site; do you know there are over 300 pages and we are adding every week. If you find this Bernard Preston site rewarding, you'll love my books, and it's your way of thanking me for all my effort at enriching your life with healthy choice foods and making a compost pile. We don't deep trench like this any more, by the way. New research suggests that minimum tillage is best for the ground so we just spread the compost over the surface, and fork it in a little. The alternative is to turn it into a worm farm, starting with cardboard bits at the base, waste from the kitchen and then add the wrigglies, proceeding down the trench with more grass cuttings, and so on. The worms will follow the waste as you add it. Cover the trench with leaves or other porous material as the worms must have air. BROCCOLI FACTS ... number one in anti-oxidants. ANTI-CANCER. Making a compost pile, as you can see, is all about healthy living, one of Bernard Preston's passions. Interesting facts about strawberries indicates they are number two in the antioxidant stakes. Bernard Preston books are in two genres; the chiropractic books are for everyone, but this trilogy may not be to your liking; you can test the waters as Book I is free at the A Family Affair page. They have nothing to do with making a compost pile! Few nicer (and, for the Save the Planet day, keep the CO2 down) gifts than a memorial tree. My sister-in-law gave me a Yellowwood tree, one of South Africa's very special slow growing indigenous species. Amongst its roots are my mother's and a very special friend's ashes. One day I'll go in there too! Not this week, please Lord! I still have too much to do, and my seventh book to finish. But it's wonderful to have the tree right in our front garden where every morning I can enjoy it. Brings back all the happy memories. And, if you're strong, along with the gift, offer to plant it for them. All the stuff from making a compost pile will give that sapling a wonderful start; memorial tree planting will really then come into its own. But beware, the hole should be 3'x 3' x 3' deep. You may need a chiropractor before you're finished! 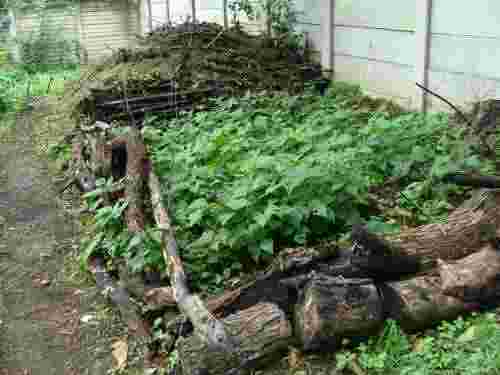 USEFUL LINKS @ Making a compost pile. Allow me to introduce myself; after a most satisfying professional life as a chiropractor, I find myself semiretired with time on my hands. Having had umpteen male patients who have dropped dead within a couple years of retirement, I have been determined to keep busy. Making a compost pile is just one of the many. The first chore was to reclaim our South African garden from the jungle; seven years of neglect whilst we were in the Netherlands had to be overcome. 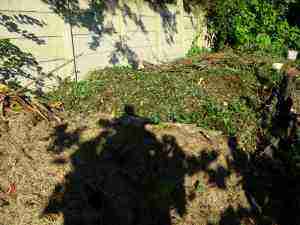 Making not one but many compost piles from the verdant overgrowth was the first step. It started as a chore but soon found a place in my heart as I watched Nature going about its business. Second was to re-establish my apiary; six hives provide us with plenty of raw honey. Before long it became apparent that the electrical grid was in dire straits with no light at the end of the tunnel; almost daily load shedding soon became a reality, as did the threat of total blackout. A solar farm became mandatory. Now, I've finally made a start with my seventh book; it's a novel that been brewing, finally becoming something of an obsession. It concerns the first married Pope in a millennium since Hildebrand excommunicated all the married priests; the heretic should have been burned at the stake. And now I'm wondering if I have the energy to start a masters research thesis on the chiropractic management of hip dysplasia and femoro acetabular impingement syndrome. Probably not; life has become very comfortable behind the geraniums as the Dutch quaintly say. Retirement is good; there's a lot more to it than making a compost pile.